(or the Dragon-Skin Wrap from the IK Holiday Gifts 2007). I've been asked for some possible substitutions, so here they are. Please remember that swatching is more important than ever when substituting yarn! In addition, I have personally worked with only a couple of these yarns, so don't consider the list below to be anything more than a starting point for finding an alternative for the Kollage Yarns "Yummy" called for in the pattern. Especially since there is a PLETHORA of yarns in the proper weight range! My criteria for putting a yarn on the list: same gauge using the same needle size as the "Yummy" (5.5 sts per inch on US #6 needles*); range of colors that appealed to me; some sheen; yarns that would seem to have good stitch definition. 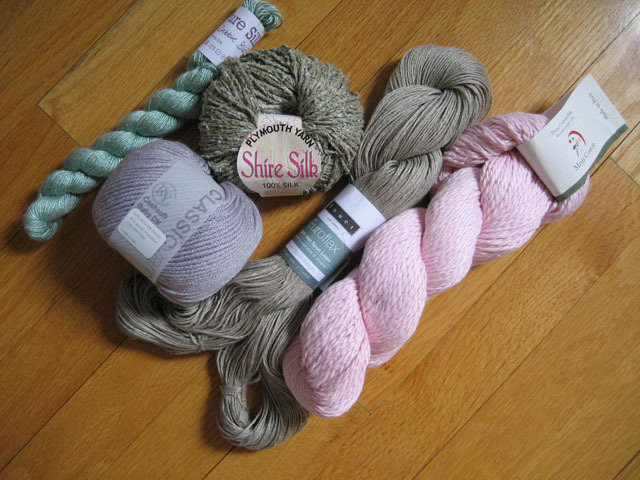 I also tried to choose yarns from a variety of price points, and finally there are some yarns suitable for warm weather or "no-sheep" types, too. *I noticed that the Kollage Yarns website now calls for US Size 7 needles with this yarn, but the ball bands on the leftover yarn I have call for US Size 6. Which is what I used. Let me first say that I am very impressed with Euroflax. It's not very soft on your fingers while knitting, but the sheen! The stitch definition! Did you see all of those gorgeous colors on the Louet North America website?? I was having such a hard time choosing one that I finally went with Natural; to some it may appear drab, but it reminds me of the lovely silvery beige coat that gives those silly Weimaraners such a deceptively elegant look. The photo above was taken after I ironed my swatch, because--silly me--I forgot to take a picture of it after I wet-blocked it, when the lace stitches were really standing out nicely. And the second photo? After I wet-blocked, I thought, you know, what a waste of a yarn that can be MACHINE WASHED AND DRIED! Plus, rumor has it that it just gets softer with every cycle. 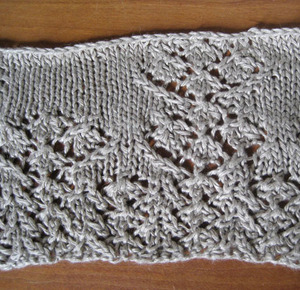 Alas, while machine drying does make the fabric very soft, it turns the lace into the knitted equivalent of lichen. 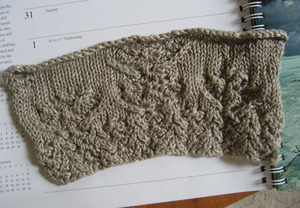 So, while I am mulling over the options for a stitch pattern that will look good without blocking, for a future Euroflax project (and I have at least one already in mind), I have moved onto Berroco Touche in Green Tea for the Four Sisters pullover. Although I did in fact get some knitting done yesterday, the day was mostly devoted to holiday-appropriate activities such as eating and drinking to excess, swimming, hanging out by the pool with the relatives, breaking up fights amongst the overtired children, and, oh yes, attending the world-famous Cotuit 4th of July Parade. 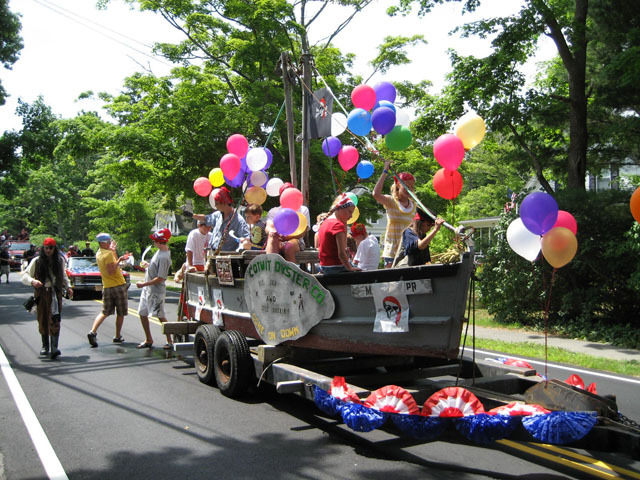 Above is one of the fine parade floats which demonstrates why we have indeed earned that world-famous status. On the needles is my own Lutea, in the slightly too-pink yarn shown in the photo--Misti Cotton, a cotton-silk blend. It's very soft and working up nicely, and what the heck, every girl needs at least one garment in a super-sweet cotton-candy pink, right? (It's pinker than it appears in the photo.) But hopefully that will be a quick knit, so the question is: now what? I'm dying to do something with all of these yarns: from left to right, Debbie Bliss Pure Silk (finer than I expected, but I might try using it doubled); Rowan Cashsoft Baby DK, a merino/microfiber/cashmere blend; Plymouth Yarns Shire Silk; Louet Euroflax (100% linen, machine washable and dryable); and the Misti Cotton. But right now that Shire Silk is calling me; I think it may be perfect for a long-sleeved pullover incorporating the Four Sisters stitch pattern--see it swatched here.